This is a FAQ page for the Payable page, please click here: payable.ocadu.ca. How do I get to Payable? I want to add credits so that I can buy supplies in the Shops and Studios. Which account do I add credits to? I want to add credits so that I can self-serve print on campus, the Digital Print Centre (Print Shop) at 51 McCaul, or order prints online. Which account do I add credits to? How long does it take for the credit to be added to my account? Will I be able to use my credits right away? How do I check the remaining balance on my accounts? How do I check my Payable balances within the myOCADU app? What forms of payment does Payable take? My preferred method of payment isn't listed as an option. How do I pay? How are taxes charged when I add credits to my accounts? Can I still buy class supply tickets and PaperCut print vouchers? I have some tickets and/or vouchers. Can I still use them? I have too many credits in one account and would like to transfer some credits to my other account, how do I do that? How do I use the credits that are on my Materials account? 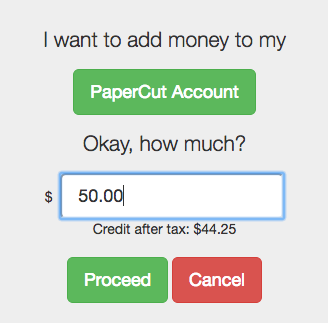 How do I use the credits that are on my PaperCut account? Can I use my credits to pay for my locker, Library fines, AV fines, or Apple Repair? How do I get a refund from my Payable Materials account? How do I get a refund from my Payable PaperCut account? I’m a faculty member. Do I need to load funds onto my PaperCut print account? Can my friend or classmate use my OCADU ID card to buy materials or pay for prints for me? What should I do if I lose my OCADU ID card? A. Payable is OCAD University’s online payment system that lets students, staff or faculty add credits to their Materials or PaperCut (print) accounts. Payable replaces the old class supply ticket and print voucher system. Q. How do I get to Payable? Q. Who does it apply to? A. Students, staff and faculty can add credits to their PaperCut account for printing on campus, and their Materials accounts for purchasing supplies or rentals in Shops & Studios. Staff and faculty can also load funds to Payable Materials or PaperCut accounts for personal materials or printing purchases on campus. Note that for institutional printing, staff have printing allowances tied to departmental 'Shared Accounts' while faculty have print allowances tied to their curricular needs and managed by their Faculty offices. Q. What can I buy with these credits? A. You can purchase supplies and pay for rentals in the Shops and Studios, self-serve print on campus, print jobs at the Digital Print Centre (Print Shop) at 51 McCaul, and order prints online. Q. I want to add credits so that I can buy supplies in the Shops and Studios. Which account do I add credits to? Q. I want to add credits so that I can self-serve print on campus, the Digital Print Centre (Print Shop) at 51 McCaul, or order prints online. Which account do I add credits to? Q. How long does it take for the credit to be added to my account? Will I be able to use my credits right away? A. The credit will be added to your account immediately, upon a successful transaction, and you will be able to use your credits right away. You will receive an email confirmation of the transaction. Q. How do I check the remaining balance on my accounts? A. When you log in to Payable (http://payable.ocadu.ca), on the home page you will see two numbers for the remaining balance beside your name. The one on the left shows the balance of your Materials account (blue) and the one on the right (green) shows the balance of your PaperCut account. Q. How do I check my Payable balances within the myOCADU app? A. To view your Materials or PaperCut account balances in the myOCADU app, first ensure you’re signed in with your OCAD U credentials. Chose Payable from the menu of myOCADU app options. Once on the Payable screen, click the ‘hamburger menu’ in the upper right corner. A window will open showing you both account balances, and you have the options to top them up directly within the app. Q. What forms of payment does Payable take? A. You can use a credit card (Visa, Mastercard, American Express, or Discover), or pay directly with a chequing account enabled to make online payments (Interac Online, or Visa Debit). Not all financial institutions support Interac Online or Visa Debit. Please contact your financial institutions if you have any questions about using your card for online purchases, or any applicable fees. When paying using Visa Debit card, please choose the "Credit Card" option when loading funds to your Materials or PaperCut accounts. Q. 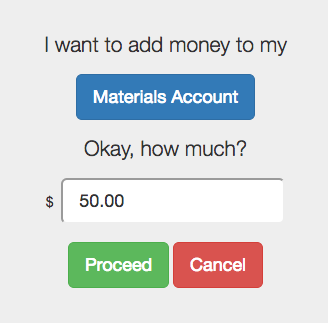 My preferred method of payment isn't listed as an option. How do I pay? A. You can pay directly with Visa Debit if you bank with one of the following institutions: CIBC, RBC, Royal Bank, Scotiabank, or TD Canada Trust. Please click here for more information on Visa Debit cards. You can pay directly with Interac Online if you bank with one of the following institutions: BMO Bank of Montreal, First Nations Bank of Canada, RBC Royal Bank, TD Canada Trust, or one of these participating financial institutions. Q. I only have cash, or I want to use a regular debit card, and I want to add credits to my account. How can I do that? A. To load funds onto your account(s) using cash or a regular debit card, visit the Cashier window on the 7th floor of 230 Richmond Street West. Q. How are taxes charged when I add credits to my accounts? A. Taxes are not charged when you add credits to your Materials Account because the tax will be charged in the Shop or Studio. Taxes will be charged when you add credits to your PaperCut account. The amount that will be credited to your account will be the amount that you enter, minus the tax. Q. Can I still buy class supply tickets and PaperCut print vouchers? A. No. Payable replaces the need for class supply tickets and print vouchers. Q. I have some tickets and/or vouchers. Can I still use them? A. No. Tickets/vouchers are now void. Q. I have too many credits in one account and would like to transfer some credits to my other account, how do I do that? A. Unfortunately, this is not possible at this time. Q. How do I use the credits that are on my Materials account? A. When you are in the Shops and Studio, present your OCADU ID card (student or employee) to the staff person, where they will scan your card to debit your account to process your purchase. Q. How do I use the credits that are on my PaperCut account? A. When you are in the Digital Print Centre (Print Shop) at 51 McCaul, present your OCADU ID card (student or employee) to the staff person, where they will scan your card to debit your account to process your purchase. You can also use the credits when you print on campus and when you order your prints online. Q. Can I use my credits to pay for my locker, Library fines, AV fines, or Apple Repair? Q. Can I get a refund for my tickets? A. No. All tickets are now void. Q. How do I get a refund from my Payable Materials account? A. Refunds of Payable Materials account are processed on a per term basis and are paid by cheque. Refunds may be requested during the final two weeks of each term (Fall, Winter, Spring/Summer). The minimum amount eligible for processing a refund is $20.00, and it will take 1-2 weeks to process the refund request. Requests for a refund must be made at the Studio Management Office on Level 1 of 100 McCaul Street (MCA 102), Monday to Friday, 8:30 a.m. to 4:30 p.m. Your current address or where you would like your refund cheque to be mailed (optional); you can also choose to pick up your refund cheque at the OCAD U cashier when it's ready. Q: How do I get a refund from my Payable PaperCut account? A. Only funds added to your PaperCut account through Payable are eligible for a refund. Credits allocated through payment of Laptop Program Fees are not eligible for refunds. Refunds are processed on a per term basis. Refunds may be requested at any time, however processing of refunds will only occur during the final two weeks of the term in which the refund was requested. The minimum amount eligible for processing a refund is $20.00 worth of credits. HST will be calculated and added to the refund, when the minimum amount eligible is met. It will take 1-2 weeks to process the refund request. Your current address or where you would like your refund to be mailed to (optional); you can also choose to pick up your refund cheque at the OCAD U cashier when it's ready. Q. I’m a faculty member. Do I need to load funds onto my PaperCut print account? A. No. Faculty members are allotted print allowances by their Faculty offices for curricular purposes. However, if you want to do any personal printing, you can do so by loading funds onto your PaperCut account and debiting them as needed. If you have questions about your print allowance for curricular printing, please speak to your program assistant. Q. Can my friend or classmate use my OCADU ID card to buy materials or pay for prints for me? A. No. Your OCADU ID card should only be used by you. Q. What should I do if I lose my OCADU ID card?